A certified Inman Aligner dentist will determine your suitability for the Inman Aligner treatment, before it can be started. The initial consultation will involve an examination of your teeth, and a discussion about the entire procedure. After determining the suitability for the Inman Aligner treatment, impressions of your teeth will need to be obtained; the impression will then be sent to a laboratory, where the customised Inman Aligner will be fabricated according to your own specifications. Once the Inman Aligner has been created using your teeth impression as a guide, you will then have to go for an initial fitting of the aligner. Any adjustments that need to be made will be done to the aligner, to make sure that it will work in an optimal way to move your teeth into a more properly aligned position. You will be asked to wear the aligner for 16-20 hours per day, every day optimum teeth alignment results. Every two to three weeks, you will be asked to visit your dentist to have the progress of the Inman Aligner checked, until the desired teeth alignment is achieved. can have a huge impact on your confidence level – there is something very comforting about the fact that you know your smile looks as good as it can possibly be. A great looking smile is affected by how even or straight the front teeth are positioned, as these teeth are the ones that are readily noticeable when you smile, or even when you open your mouth to speak to others. Crooked teeth can be corrected with the help of orthodontics, which will work in moving the teeth into a position that is straighter – resulting in a smile that looks more properly aligned. Even with the benefits that teeth straightening treatments provide, there are still some people who hesitate to undergo these orthodontic procedures – mainly because of the lengthy treatment period, and the inconvenience involved. The Inman Aligner works in straightening the front teeth in as short as six to 16 weeks, bringing the desired results with utmost convenience. 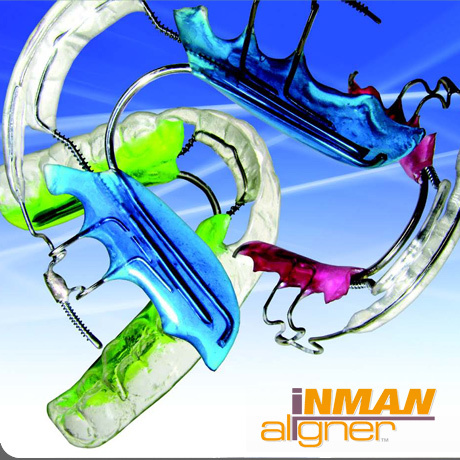 The Inman Aligner is composed of aligner bows powered by nickel titanium springs; the aligner bows work with a push and pull movement, with the opposing forces gently working to guide the crooked front teeth into a more properly aligned, or straighter, position. The aligner bow positioned along the inside portion of the teeth will work on “pushing” the affected teeth outwards, while the bow on the outer teeth surface will work on “pulling” the teeth back. The Inman Aligner will actively be responsible for straightening the teeth over a large range of movement – the reason why it works quickly, with most cases successfully completed within six to 16 weeks of treatment. An Inman Aligner treatment can effectively correct issues concerning front teeth alignment, such as teeth protrusion, rotations, teeth crowding, and crossbites; it can also successfully deal with cases of orthodontic relapse. The Inman Aligner can be used by itself as a cosmetic dentistry procedure, but it can also be combined with bonding or teeth whitening procedures to achieve the desired aesthetic improvement.